-How would you sum yourself up in a sentence? 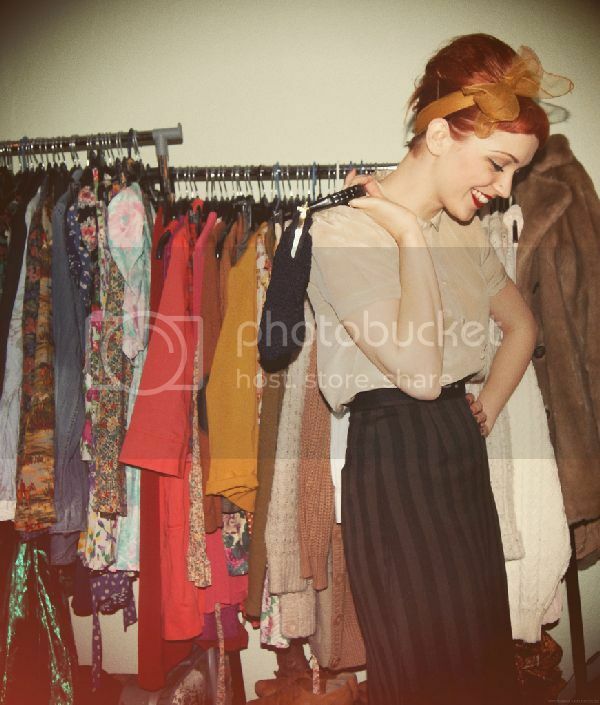 A perpetually smiling redhead with creative tenancies and a life-consuming love affair for all things vintage. I work as a concession manager for a shoe company. It's an ideal job because it gives me a lot of free time. In 2011 I will utilising my Printed Textiles degree and starting my own business. I hope to start with accessories such as Peter Pan collars and clutch handbags before venturing into home decor. The styling will be vintage inspired, with a very British feel. -What sparked your interest in blogs? It started off as something to accompany my degree work, but I soon explored other blogs and ended up getting much more enthusiastic about the personal side of blogging. It's a great little community to be a part of. -What's your to die for item? I don't know if it's to 'die for' but I do own a really amazing vintage decoupage suitcase which always attracts attention wherever I take it. 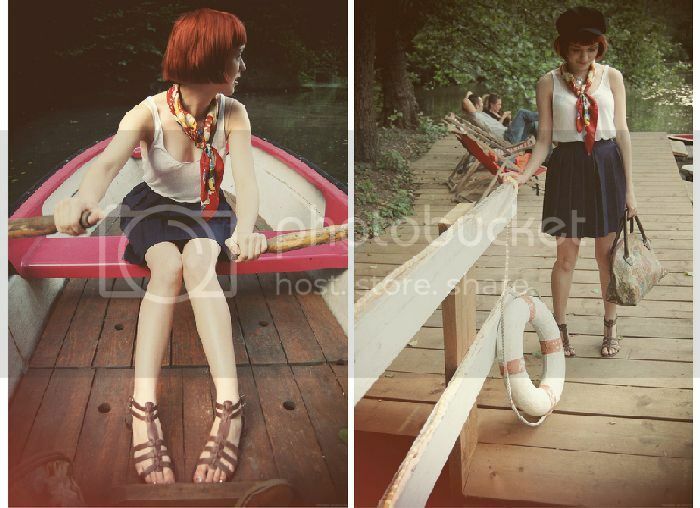 It features on some of my lookbook photos and I've even had strangers on the tube compliment it. It's covered in cuttings from children's fairy tale books. I bought it on eBay impulsively but it's one of my favourite possessions as it's completely original, unique and beautiful. -If you could describe yourself in three words and another three for your style, what would they be? -Who's your hero and why? I have a few people, who perhaps in some manner or form I idolise. Admittedly a majority of them are either elderly or deceased! Frida Kahlo, Judy Garland, Audrey Hepburn. Not forgetting of course Iris Apfel & Catherine Baba for their irreverent style! I also admire some fellow bloggers, such as Nicole from 'Fashion Forestry' everything that girl wears is a complete delight to me. I think creativity can be spawned from anything, and it's normally the most unlikely places where you find it. I love old black and white movies and musicals of yesteryear, and have enough style books to open my own library! I am forever finding little snippets of inspiration wherever I travel, particularly as I spend a lot of time in Brighton, where they have fantastic vintage markets and shops. I collect vintage photographs, and have an extreme soft spot currently, for anything that dates from the 1940's or 50's. I love the glamour and ladylike aesthetic of those eras. It's a joy to be able to see relics of past decades and be able to combine them altogether, I think that's probably a very modern way to approach style. Oh goodness! Who knows? I always liked the idea of ending up an art tutor but I think I'll take it a year at a time, and first put all my focus in getting my business off the ground. 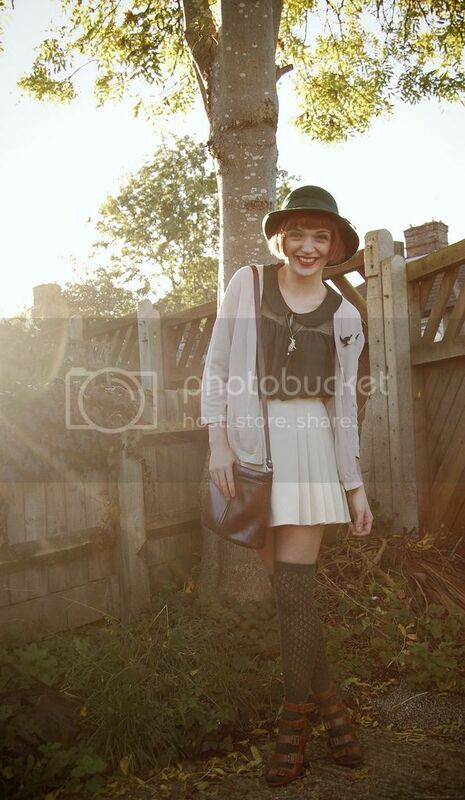 I've been a fan of her adorable vintage style via her blog for a while. With her red hair and her eclectic vintage style, she's easy to fall in love with. Find her blog here. A big thanks to Kerry.